All Saints, has a number of Mission Partners that we support both in terms of prayer and finance. Mission is important to us, and we are eager to help others in their willingness to reach out to those around them. We have listed here those Charities\Missionary Societies\Individuals whom we are working with at present. ‘Charles & Frances de Roemer in association with B.E.M. (Belgian Evangelical Mission), are based in Binche, Belgium. Their church is one of a number of churches planted by B.E.M. The church seeks to glorify God and serve the local population. Charles and Frances hope that it is a living church which is exciting to visit, both for those who are young and those not so young. The church often finds itself helping recent immigrants to Belgium, people who can so easily find themselves on the fringes of society. All Saint’s Church, Trull is their ‘sending church’ so we have a particular responsibility as individuals and as the church as a whole to be supporting them practically and in prayer. Their link to Trull is that Frances grew up in the village and worshipped at All Saints.’ They also spent some months with us a few years ago on a sabbatical. Charles & Frances can be contacted at: [email protected] where you can ask them to include you on their regular news circulation. Bosco & Heidi Bukeera returned to Uganda in 2018 with their two boys Ezekiel and Eleazar after training in the UK. They are in the process of planting a new church in Bosco’s native home whilst teaching the fundamental doctrines of the Christian faith. 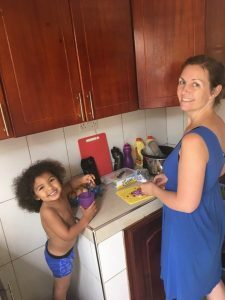 Heidi has a considerable amount of experience of Uganda, having lived there for many years and having run a home for street children, who had lost connection with their families. One of their first priorities has been to find a house, which they have now achieved. This enables them to hold Bible Studies, and enjoy fellowship with the “constant stream of visitors”. Thank you so much to those who have contributed towards the purchase of this property – please pray for the Lord’s providence as they need to pay the final installment of £11,500 for their home by April. Jenny Green works with the CMS (Church Missionary Society) in Bankfoot, Bradford, where she serves as a Community Chaplain. Jenny who has extensive overseas mission experience, now finds herself back in Bradford, where she originally served as a curate in the 1990s. She is there with her adopted family Hannah & Joseph. The local community is in great need, but Jenny finds that her role as Community Chaplain enables her to easily come alongside those around her. Her prayer is that the community will become aware of Jesus and discover God’s transforming love and power. The Sumpter Family in association with VDM (Verenigte Deutsche Missionshilfe). 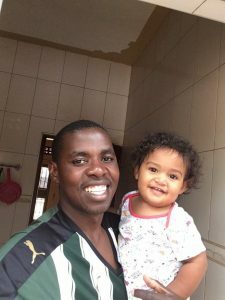 Philip & Ingrid Sumpter with their young family are based in Israel at Nazareth Evangelical College. Their vision is to see the Arab evangelical churches in the Holy Land growing in the knowledge of God through the study of scripture. Philip & Ingrid hope to become part of the local Arab Israeli community. Philip with his PhD in the Old Testament and experience of the region, is working at the Evangelical College. To receive their monthly newsletter – send an email to: [email protected] with “Newsletter” in the subject heading. If you would like to, also add a few words about yourself. The Belgrade Bible School was set up in 1996, to give Biblical training to young people from across the Balkans. Over 350 students have graduated from the Bible School in the 20 years up to 2016. The course includes Bible teaching, experience of social action, links with former students in work situations such as church planting, youth work and support for the Roma, the poor and refugees. The Bible School also puts on youth camps, conferences and courses for local Christians. Mervyn Roberts is the link person from Trull Church for the Bible School, as he regularly makes visits to Serbia. Besom is a UK charity that exists to enable volunteers to assist those around them in the local community. Time, skills and resources are made available to anyone who is in need. This could be the decorating of a house, gardening, or the supply of a household appliance etc. Besom in Taunton started in May 2005 and serves the local churches in Taunton, Wellington and the surrounding villages, acting as a conduit for those church members who wish to help others. There are about 30 similar Besoms throughout the UK. Open Door is a charity that began after local churches in Taunton realised how many homeless people there were in the area. The present premises in Mount Street have been open since 2009 and can provide breakfasts and lunches. Resources in terms of bedding, footwear and clothing are available. The charity has links to professionals from partner organisations, who may be able to assist further. Chaplains are trained individuals drawn from local churches. They are linked with a workplace or area and are there to offer friendly advice and supportive care to all. The main aim is to listen and take an interest in the people that they meet, and to give comfort and compassion where needed. The Town Centre Chaplain and team are based at their Market House offices. The Bible Society is an international organisation, working in more than 200 countries, that has tasked itself with bringing the bible to life for every man, woman and child. The society believes that as people engage with the bible, lives can change – for good. In addition; leadership training, literacy programmes and interfaith dialogue are of significance. Kay Whiteley, with the support of her church at that time, set up New Life Foundation India in 2005. This was as a result of being deeply moved by the number of orphaned and abandoned children living on the streets and railway stations in absolute squalor. Since that time hundreds of children have been rescued and given a safe, loving Christian home, education and been taught life skills. An English Medium School was built on the campus. Children come from the local villages who pay a small fee to help towards the running costs. Both the home and the school are staffed by Indians and are paid a salary. The vision of NLFI is to empower each child in to reach their full potential by equipping them with essential life skills, and growing in their Christian faith. Taunton Youth for Christ is a part of the Church with a specific aim to reach every young person with the good news of Jesus Christ. We do this by serving the schools and serving the church. Serve the Church: Support to run youth clubs, consultancy, running specific programmes, The Gathering, Youth & Children workers prayer breakfast. Here at All Saints Church, Trull, they are involved with ‘Dropzone’ every Tuesday in term time. It has been amazing to see young people transition between school clubs and church clubs.